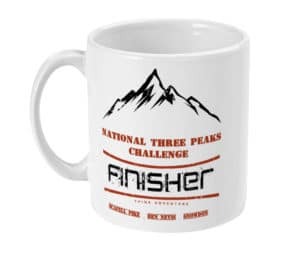 GPX File: National Three Peaks routes. Desktop only. Scafell Pike is the smallest of the National Three Peaks, but it is by no means an easy peak to climb. 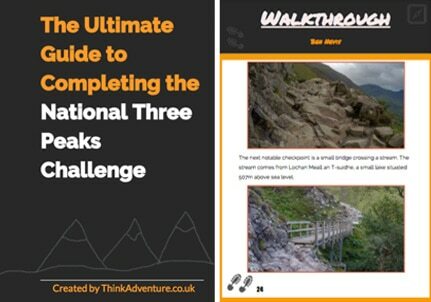 Scafell Pike has a very steep start and it tests the legs and heart on the never-ending steps and tough incline. A few rest stops may be required when climbing Scafell Pike. All-day parking is available in the Wasdale National Trust Car Park for £7. The car park is next to the Wasdale National Trust Campsite and has a hot food/drinks trailer, information booth, toilets, little shop and information boards. 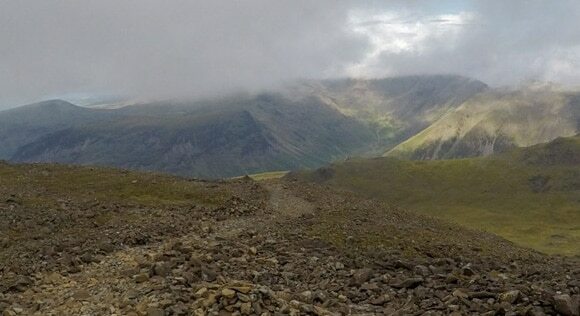 It is an ideal location to start the climb of Scafell Pike. The starting point is Wasdale Car Park. 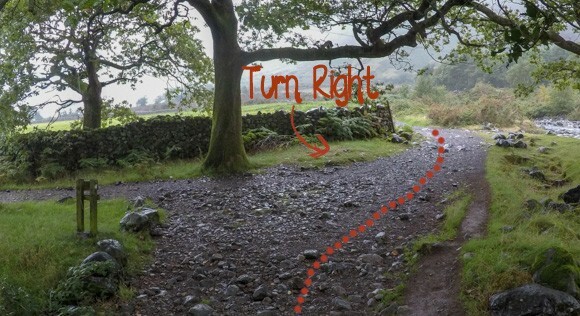 Keep following the path with Lingmell Gill on your left-hand side. At the next two-way section, bear left. Keep following the path and cross a small bridge over Lingmell Gill. After the bridge crossing you will shorty reach another divided path. Follow the path through the gate. 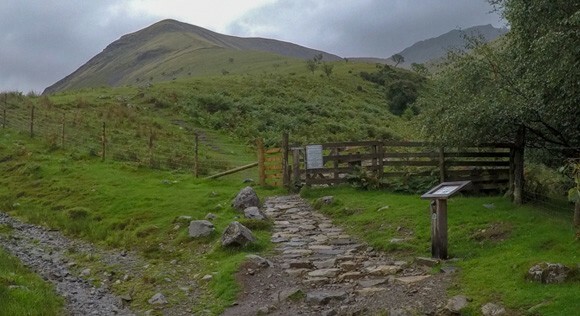 Navigation becomes a lot simpler after this point; Lingmell Gill is now on your right-hand side and you will follow this path until you reach the crossing of Lingmell Gill. For the next mile or so, it is very steep with lots of steps. This is a difficult section and can be tiring. Keep following the path until you reach the steam crossing. Following heavy rainfall the stream can be difficult to cross – don’t cross the stream if it is unsafe to do so. Carefully cross the stream. It is passable without getting your feet wet, but be careful when stepping on the stones as they may be slippery. 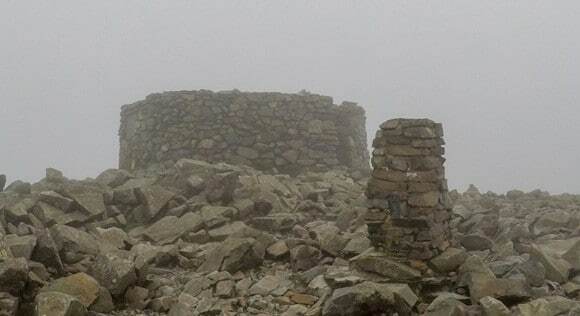 The incline is continuous up Scafell Pike with limited respite. Scafell Pike is the smallest of the National Three Peaks, but it is hard work. The track is sloped in some areas providing a short relief from the steps. The path splits at Hollow Stone. Follow the path to the left. You have completed the hardest inclines at this point and the route from here is fewer steps but more rocks and stones. It is easy to follow but keep an eye on the path as it is easy to venture off the main path if you become distracted. Note: The black bags may not be there on your hike. Don’t use them as reference points. When climbing the path there is a joining section from the left. It’s intuitive to keep following the route to the right but make sure you don’t miss it. The final climb of Scafell Pike is very rocky underfoot. Visibility can also be poor. The below photo was taken in August near the summit of Scafell Pike. 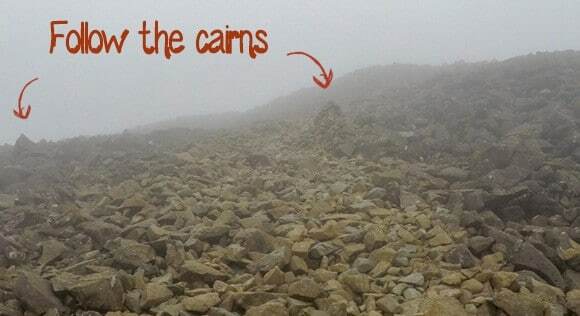 There are cairns along the way to guide you in the right direction. The trig is easy to find on Scafell Pike. The path leads you directly to it. There is a shelter, too, which is easy to locate. 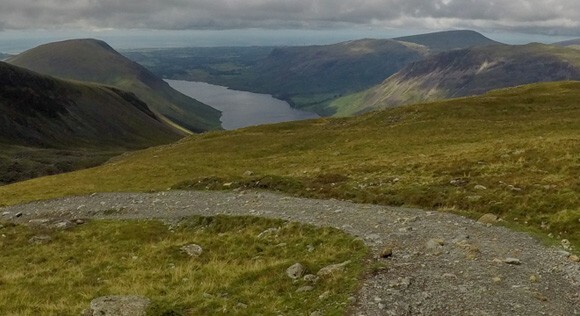 The route down Scafell Pike is the same route you took up. If you become disoriented, head from the shelter to the trig and keep going. This will lead you straight onto the path. Use the cairns to help navigate down, too. 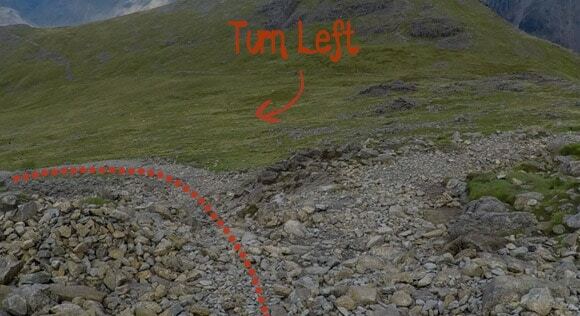 On your return journey to the base of Scafell Pike there is an important left turn. Keep an eye on your map to ensure you don’t miss the turn. 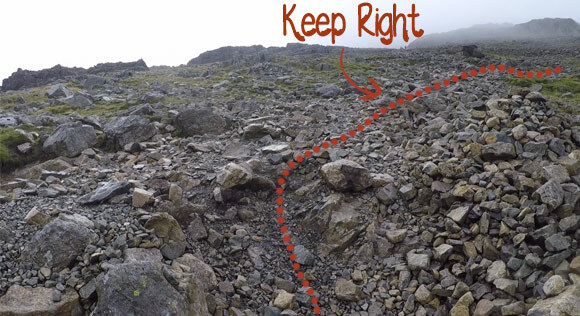 After the left turn, the descent down Scafell Pike is straightforward. Especially as the route is fresh in your mind and the lake Wast Water is in your eye line. Nearer the bottom there are a couple of turns leading you back to the car park. The first is a split in the path; keep left and keep following the fence. There is a sign for Eskdale and the National Trust Car Park. Keep Left. The final turn is right. Follow the stream back to the car park. 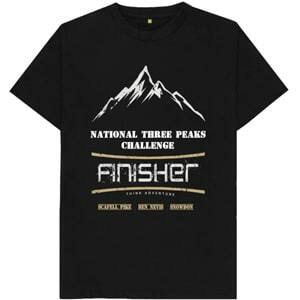 Well done on completing Scafell Pike!